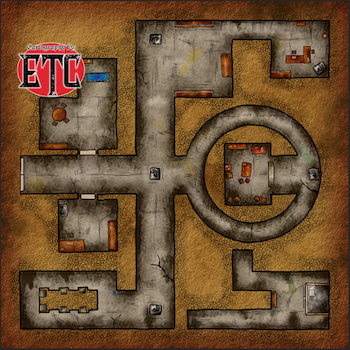 Get the FREE PDF of this map here ! 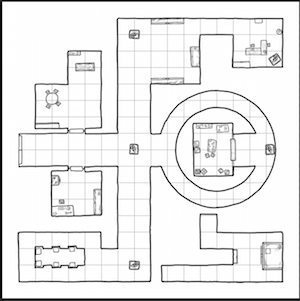 This is a short adventure that can be adapted or modified to fit your setting or current level of play. 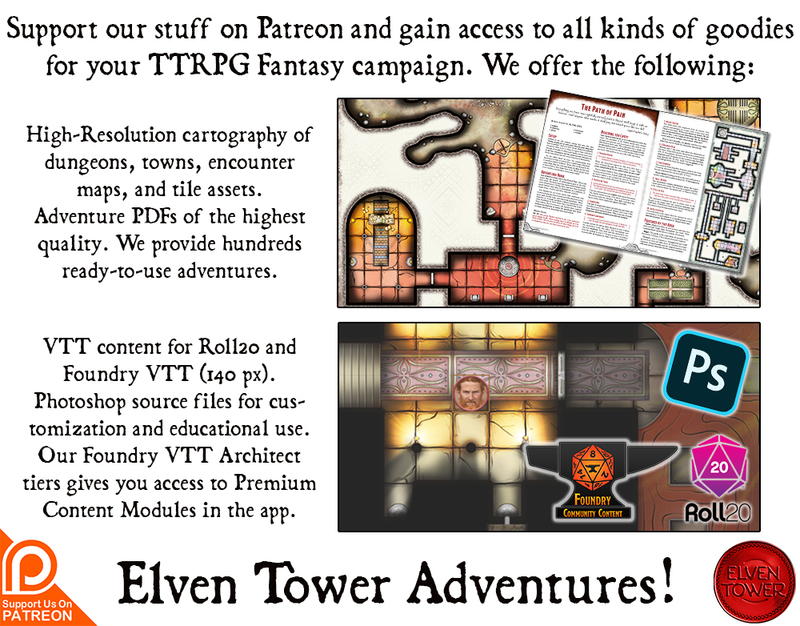 It’s about a dwarven vault which is hiding something valuable to a group adventurers. It could be just money and wealth, maybe it is a magic item, a forgotten scroll, a family heirloom. Whatever it is, it is very important. Inside this underground complex, there is a vault in the middle of a circular construction (see the map). This is the regular vault, it is heavily protected. Its door is built from sturdy metal alloys but the real protection is its lock. Built by master dwarfs and gnome tinkerers. The lock uses a series of slides, buttons and levers; when used in the correct combination, the vault door opens. If the wrong combination is used, this is a great place for a trap. Being as secure as it is, this vault is a decoy. Yes, it holds things of value, but the really valuable things are not here. There is a secret vault that is only accessible through doors hidden in the complex. Two such entrances exist. The main room inside the secret vault is a good place to add another trap. In the main room a 10 ft. tall safe-box is found. The lock in the safe is as complicated as the one on the decoy vault. A person good with locks and mechanical devices might be able to crack the safe by accessing a panel on the top that is normally used for oiling the internal parts. It doesn’t make the cracking any easier however. As additional protection, dwarf guards are on shift. There are several office areas where dwarves keep the financial books of their patron’s state. Some of them are able fighters and have their weapons close. There are 4 statues throughout the place. They are decorative, but in case you judge appropriate for your game, they can help protect the vaults against trespassers. Choose adequate stats for them; the gargoyle stats are good for lower level parties, while stone golem stats are good for level8+ parties. A local dwarf Jarl is said to be in possession of a particular magic item or magic components like diamonds. He won’t part with them and is not willing to sell. Perhaps a raid is necessary. 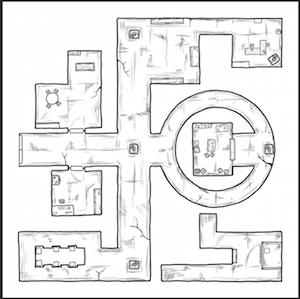 Adventurers are hired by a gnome engineer to infiltrate the underground complex and raid the vault. Not because of the contents, the gnome is not interested in that. What he wants is the blueprints of the vaults. 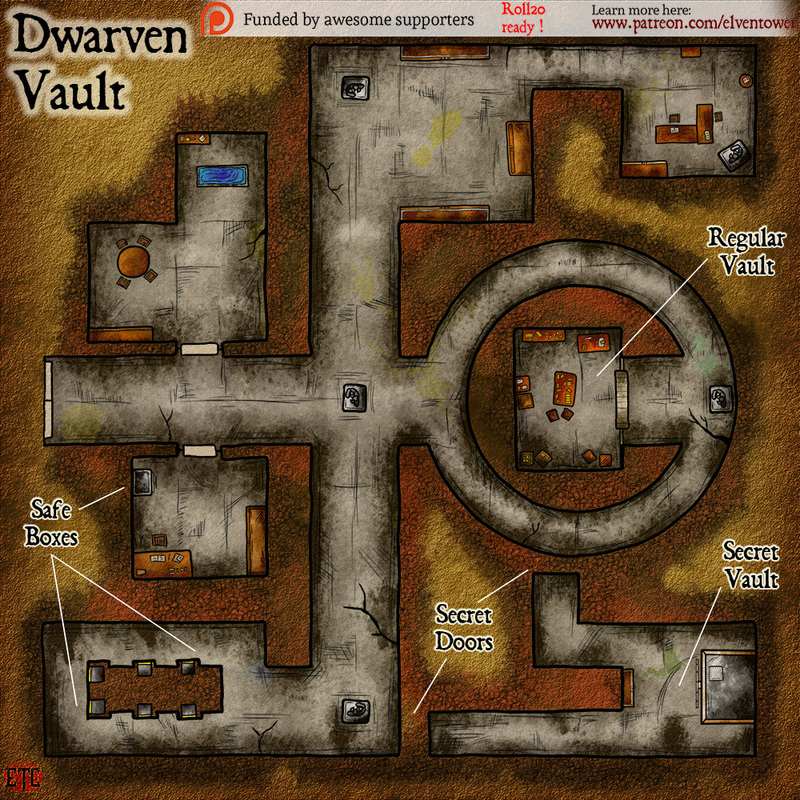 The dwarven Jarl is aware because of a spy, that a group of criminals is about to raid his underground vaults. He hires adventurers to help keep his belongings safe. When the thieves arrive, they offer a split of the loot with the PCs. A new patron of the adventuring party is showing them his house. He is particularly proud of his vault. During the tour, a band of criminals enter the house and the underground complex with the intention of looting the vaults and kidnapping the wealthy patron. Step 1 – I always start with a crude sketch I set in a different layer. It’s just something fast to work on later on. It ends up being deleted. Step 2 – This is the first real sketch. I lay down the main rooms and doors. I also add a layer with a grid layer mask. By the way, this grid is 140 pixels per square. Great for a Roll20 game. 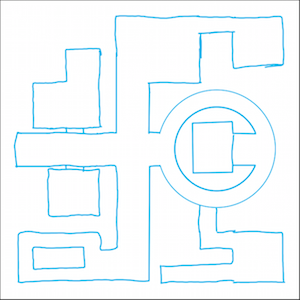 Step 3 – Add main furniture and map features. 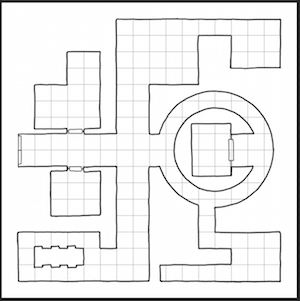 In this case there is a bunch of tables, desks, bookcases and the different vaults and safeboxes. This is just a zoom-in of Step 3, you can see the desk, chair, a wardrobe and a safebox. 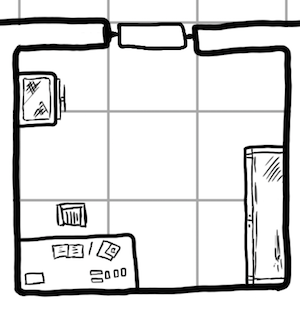 Step 4 – I drew smaller details, mainly in the floors of the map. It’s all about making the place look more real with imperfections and floor texture. I didn’t go very deep because part of the texture will be added in the coloring phase too. 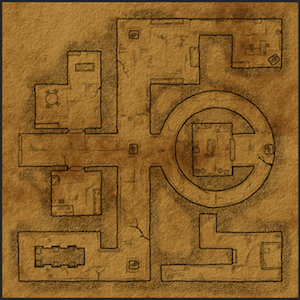 Step 5 – I added an aged paper background I created in GIMP. I also added an underground texture for the parts “outside” of the map, this makes it look like it’s underground. Step 6 – Main colors are added. As it is now, it looks too bright and cartoon-ish. It’s normal at this point. 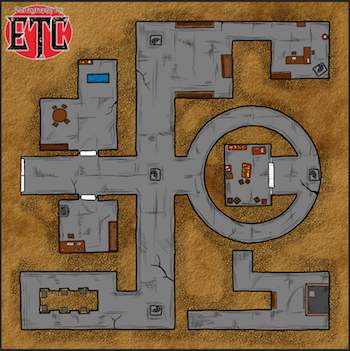 Step 7 – Shading and color details really help bring out the textures and life of this map. I also added a burnt border for the overall illustration, enhancing the aged paper look.